culminating with a comprehensive Machu Picchu experience. Brand g Vacations is pleased to introduce our 2019 Amazon Cruise and Machu Picchu Expedition travel program. The cruise is operated aboard the luxurious Delfin III, which offers some of the most spacious accommodations along the Amazon River. This smartly designed, 44-passenger, colonial-style vessel, provides the ultimate in comfort, with five-star amenities. It’s the perfect combination of inspiring places and rich history in the comfort of an all-gay environment. Virtually all-inclusive rates starting from $5,299 per person. It’s the perfect combination of inspiring places and rich history in the comfort of an all-gay environment. Virtually all-inclusive rates starting from $5,799 per person. 2 nights hotel accommodations in Lima including welcome reception and daily breakfast. Guided tour of Lima including welcome lunch. Domestic flight from Lima to Iquitos, the gateway to the Amazon. 4 night cruise including all meals. Cruise includes local pisco based cocktails, local beers, and local sodas with lunch and dinner as well as house wine with dinner. Domestic flights from Iquitos to Cusco. Two nights hotel accommodations in the Sacred Valley including daily breakfast, one lunch and one dinner. Full day sightseeing in the Sacred Valley. Vista Dome train to and from Machu Picchu. Two visits to Machu Picchu. One night hotel accommodation in Machu Picchu village including breakfast, lunch and dinner. One night hotel accommodation in Cusco including breakfast and farewell lunch. Half day city tour of Cusco. Lunches on land include two glasses of local beer, or soft drinks. Dinners on land include two glasses of local beer, soft drinks or house wine. Lima: sightseeing with a local guide; visit Archbishop’s Palace, Government Palace, San Francisco Monastery and Larco Herrara Museum. Iquitos: visit the Manatee Rescue Center. 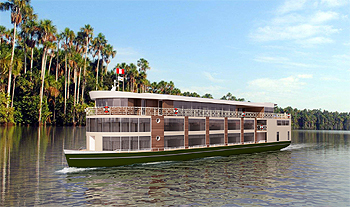 Cruise: 4-night cruise in a deluxe, outside suite cruising the Peruvian Amazon River aboard the Delphin III. Welcome cocktail & dinner; guided sightseeing each day with a local naturalist by skiffs during the day and evening; native village visit. Sacred Valley: visit Ollantaytambo with its huge Incan fortress rising from the edge of town; visit the Pablo Seminario Ceramic workshop in Urubamba. Machu Picchu: board the train for the scenic journey to Aguas Calientes; sightseeing of the ruins with a local guide. Cusco: sightseeing with visit to Santo Domingo Monastery and the Cathedral; Farewell lunch.